Shoppers use the Web to compare prices more than ever. During tough economic times, the Internet is proving to be very important as people try to save money where they canand merchants need to be smart if they want to reap the rewards. That's the message from market researcher comScore, which recently presented its year-end report on e-commerce and gave a somewhat guarded outlook for 2009. "We've got to be cognizant [of the Internet], I think, not just as a sales channel, but as a way consumers collect pricing information," says Gian Fulgoni, comScore's chairman. "Savvy marketers really need to focus on consumers." Shoppers are comparing prices online more than ever, according to the firm. In January alone, 76 million people visited comparison shopping engines and about 38 million searched for coupons. "This is a key issue," Fulgoni says. "It's clear from the data… that online coupons and couponing in general in these hard economic times are much more important than they have been." Thousands of people have found themselves suddenly unemployedwhich could be a reason for the popularity of Web sites such as careerbuilder.com. And people don't think things are going to get better soon. Of those earning low incomes (less than $50,000 a year) and medium incomes (between $50,001 and $999,999), 53 percent said they are more worried about the economic future than ever before. "Their confidence has been so rocked that they are likely to be conservative spenders at this point," says Fulgoni. But it's not all bad news for merchants as we get further into 2009, he notes. Despite the rough times, e-commerce grew by 7 percent in 2008, and consumers are opening their pocketbooks more freely online than in brick-and-mortar shops. January even saw a 2 percent increase in overall online sales compared to the same time last year, comScore notes. During that time, food and beverage stores saw an increase in business of 2 percent. However, online retail dropped 10 percent. The increase from December to January is "a positive," Fulgoni says. "[e-Commerce as a whole] is clearly out-performing the retail sector. e-Commerce continues to gain a share of wallets." January also saw seasonal gains in the tax and travel categories, reflecting the country's tendency to plan for the New Year, notes Jack Flanagan, executive vice president of comScore Media Metrix. "[The] month also saw Facebook break into the Top 10 Properties ranking for the first time, reminding us that 2009 will likely continue to see growth in the adoption and usage of social media," he adds. Knowing how to use social networks could help online sales. "I remain surprised that coupons are still delivered by the traditional media," says Fulgoni. As people wait for the U.S. economic stimulus to roll out, Fulgoni does not expect it to greatly impact sales. He says there may be a spike in sales for a month or two, but that will likely drop off with time. But as long as fuel prices stay relatively low and e-merchants offer goods at fair prices, consumers should keep coming. Survey shows more than half expect sales to rise. Some e-merchants see great growth, others great drop. 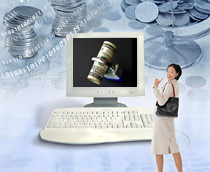 Online sellers report pay-per-click campaigns are effective. Australian buyers confess guilt about splurges in today's economy. State sets rules for redeeming notes. Smart listing strategies will ensure continued sales. Crazy bargains entice shoppers and produce repeat customers. Record-high sales kick off online holiday shopping season. Entrepreneur uses Google Docs to track bids. Site's traffic declines as overall satisfaction with e-merchants slips. Survey shows consumers plan to spend more online than in stores.